Toronto Raptors coach Dwane Casey heard the comments that came from LeBron James after he led the Cleveland Cavaliers to the second round of the playoffs. James used the words burnt, tired and exhausted, delivering those in such a weakened state that put in doubt whether he’d have anything left for the top-seeded Raptors. Yes, James will be energized going into Tuesday night’s Game 1 of the Eastern Conference semifinals between the Raptors and the Cavaliers. Yes, the Raptors appear better equipped this season to deal with James, as they bring more depth. But do the Raptors have the game plan to slow James, who is looking to eliminate Toronto for the third straight year? LeBron’s 45 points are the second-most ever in a Game 7. “The King” has now won his last 5 Game 7’s. That’s what the Indiana Pacers tried in the first round, physically banging James with a group that included Bojan Bogdanovic, Lance Stephenson, Myles Turner and Thaddeus Young. All James did was average 34.4 points, 10.1 rebounds and 7.7 assists per game. It was the fifth playoff series where he averaged at least 30 points, 10 rebounds and 7 assists. According to NBA.com/stats, no other player has done that more than once. The Indiana series showed the biggest improvement for James during his career: his post-up game. That aspect of his game was a flaw in his failed pursuit of an NBA title with the Miami Heat in 2011, especially in his Game 4 disappearing act, when James missed eight of 11 shots and showed a shocking unwillingness to use his massive frame to create space inside. In the first round against the Pacers, James — through an assortment of post-ups, layups and dunks — had 60 attempts within 4 feet of the rim (the restricted area) in the seven games and made 50 (83.3 percent). Everyone will remember the clutch 3-point game-winner from James in Game 5, but during that 44-point effort, he kept the Cavaliers in the game by scoring 12 of his 14 field goals within the restricted area. 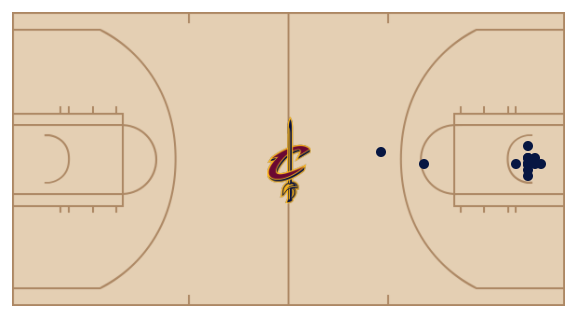 LeBron James scored 12 of his 14 field goals within 4 feet of the basket in Game 5 against the Pacers. How do the Raptors combat a 15-year vet who, in a league where everyone is 3-ball happy, has learned to dominate the paint? “We have some flexible players, versatile players,” Casey said. True. But neither OG Anunoby nor Pascal Siakam is seasoned enough. C.J. Miles and DeMar DeRozan aren’t big enough. Serge Ibaka isn’t quick enough. And no one on the Raptors is strong enough. The Raptors might be the top seed. But minus a way to neutralize James, that might be in serious jeopardy.